Recently I decided to push my army back into the 11th and 12th century, which has meant losing some pieces (visor helms, heater shields, etc). 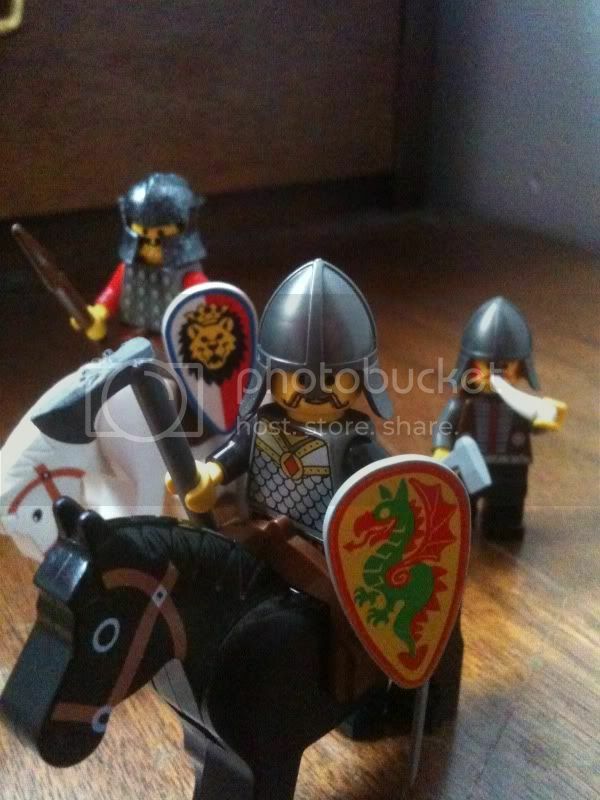 Two Normans with a Saxon soldier behind them. 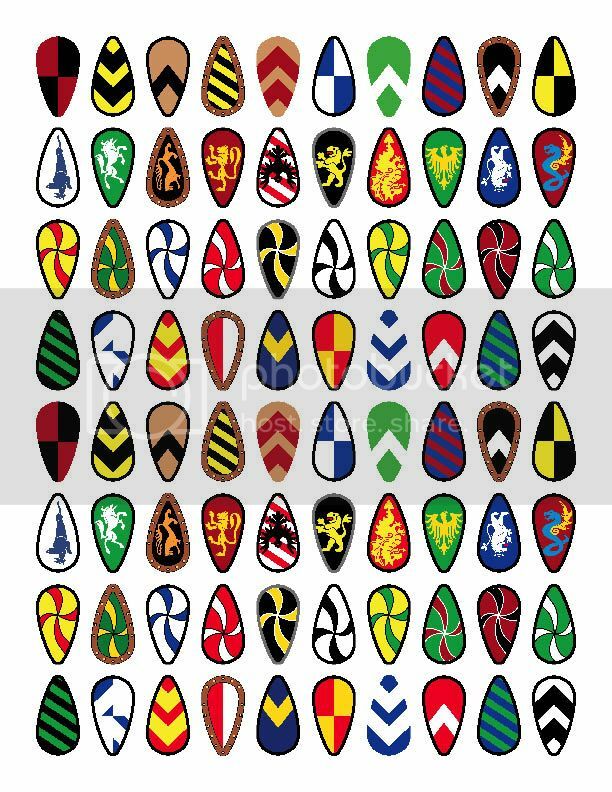 I've been looking at the Bayeux Tapestry and other Hastings-era artifacts and I saw I'll need a lot more kite shields for my Norman-esque army (and I'll do Viking targes for the Saxons, but that's another topic) and I really liked the varieties of pre-heraldic shield designs. I decided I wanted to give decals a try (especially since I have an extraordinary amount of islanders shields) and as long as I'm making a few on an 8.5 x 11 page, I might as well fill it, right? As you'll notice, not all of these are my design (Anthony Sava's Classic Castle templates helped me a lot) but I'd like to get a little feedback on their designs and also maybe some help with the printing of decals. I don't frequent hobby stores much, but is it likely I'll be able to buy single sheets of waterslide decal paper? Also, will Kinko's let me use their laser printers for waterslide decals? These look pretty nifty. When I last undertook a shield decal project, I could only find paper in 8.5x5.5, which Kinkos could not print on. I only considered Kinkos, though, because I thought my own printer wouldn't print to a high enough quality, but then I discovered how to adjust the print settings for photographic images and the the decals came out just fine. I'm unfamiliar with dry-ink printing. However, to get a metallic look on some shield bosses, I applied a shading effect in the software I used (Excel), which in my opinion, came out well. A lot of people also recommend using Brasso to remove printing on pieces. I found that Comet worked well at removing the paint, but it does leave some very slight scratches in the surface of the piece -- which didn't really matter to me since I was covering them with decals anyway. I'll be eager to see what your finished product looks like. Good luck. I like the basic designs, they look like they would make for a colourful army. Woah what a variety! Nice work! If and when these are available for purchase let me know, Id love to get my hands on some.